(1999 'Hohner') (79:40/60) English edition of what is a successful pubication in Germany, the combination of the book 'Blues Harping' with instructional cd, as taught by two harp players of international fame and reputation. Here's what the author's say: 'This book summarizes the most important aspects of blues harp playing in an easily understandable form. 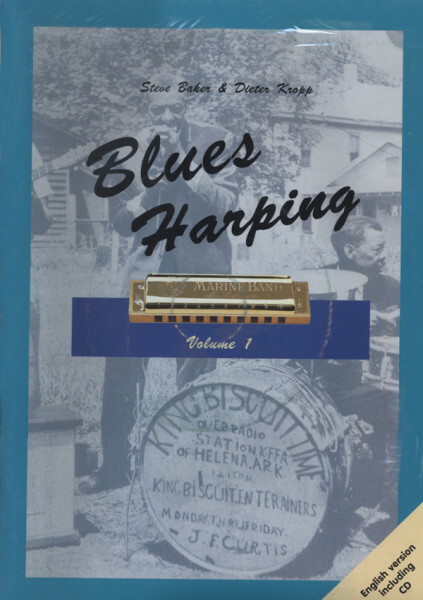 It explains how the harmonica functions, and introduces the reader to important playing techniques through practical musical examples. Although some of this information may be of use to the more advanced player, our main intention was to help the beginner to understand the blues harp, to make this mysterious and fascinating instrument more accessible, and to provide the necessary basis for further progress. ' Keep on harping'. Paperback - 52 pages - A4 format - 2 colors, partly illustrated. To go along with the instructions, you may order a Hohner 'Big River Harp' from us. DM 30.00 ea, order no. HCA 002. Kundenbewertungen für "Blues Harping Vol.1 - English (Book+CD)"